Kids get to draw their own golden coins in this St Patrick’s Day worksheet. 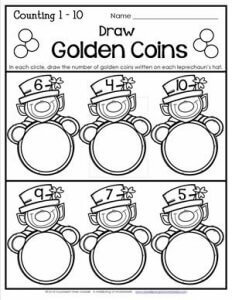 Have them look at the number on each leprechaun’s hat and draw that many coins in the circle. It might be a good idea to draw the coins in pencil and then color in yellow crayon, just so you can easily see how many have actually been drawn.